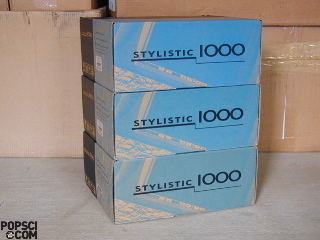 NEW, in the box, Fujitsu Stylistic 1000 computers for $39 - $65. Like new, Kodak Brownie Hawkeye camera with flash and two bulbs for $75. Furthermore, there is a monthly sales flier (PDF) that contains an occasional gem like Nixie displays B6036 and NL50318, for $55 and $75, respectively. Finally, as you spend all night looking through the seemingly endless list of surplus goodies, you can quench your case of the munchies with a NEW, in-the-box, Art Deco Manning Bowman “The Debutante” waffle maker complete with fabric power cord for $350.